and sum of RM5,000.00 (Reserve Price RM100,000.00 and above) and Buyers premium of RM500.00 (Effective 1st June 2018 0% GST) per vehicle by cash, credit card (Visa/Master) or bank draft in favour of PROPERTY AUCTION HOUSE SDN. BHD. For payments via credit card a service charge of 2.5% will be imposed. No personal cheques will be accepted. The balance of the purchase price shall be paid in full by the Purchaser within five (5) working days from the date of auction sale to the Legal Owner. All expenses incurred in respect of the ownership transfer shall be borne by the Purchaser. The reserve price display and final bid (selling) price is inclusive of GST at 0% for the vehicle subject to GST. All vehicles are sold on an “AS IS WHERE IS” BASIS and subject to the CONDITIONS OF SALE. Be sure to inspect the vehicles before bidding and no inspection is allowed during or after the auction. 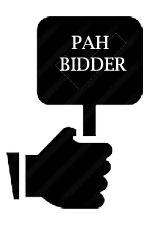 All intending bidders are advised to inspect the conditions of the vehicles and conduct their own JPJ, PDRM (Police search) prior to the auction sale. No document is given for vehicles cuts & joint. IF, Puspakom (VR-1) inspection is not done, successful bidder has to arrange for Puspakom VR-1 inspection on their own. All successfully sold vehicles must have the inspection (VR1) by Puspakom before release from store yard. NO REFUND shall be entertained for Puspakom VR 1 "Lulus Bersyarat", VR 1 "Gagal" due to engine changed and vehicles "Blacklisted" by the relevant authorities. All details of the vehicles as listed in this POS are subject to change by the Legal Owner.